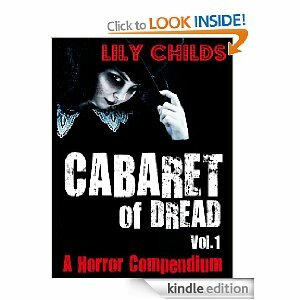 At last, Lily Childs' CABARET OF DREAD: A HORROR COMPENDIUM, VOL 1 is on Amazon's virtual shelves, all ready to be downloaded, tagged and 'Liked'. Any help in spreading the word will make Lily a happy, and grateful writer. She would LOVE to know what you think, and would also appreciate any reviews beyond words. Lily thanks you dear friends! http://www.amazon.com/dp/B007KSVXQK for US/Canadian readers and http://www.amazon.co.uk/dp/B007KSVXQK for Brit horror fans. - THE INFANTA TRIPTYCH - living, dying art - breathing, pulsing... ancient. Words spill from the babbling mouths of demons and murderers throughout Cabaret of Dread, combining fear and even humour as the reader encounters serial killers and ghosts, historical entities and psychopaths, not to mention a scuttling vampire or two. Cabaret of Dread is extreme horror FOR ADULTS ONLY. Ethereal and spiritual elements battle with the visceral and the insane; lustful adoration dallies with laboured, lingering death. The Cabaret will shock, it may well offend. But it is beautiful – at least in the author’s mind - and that’s where the darkness lies. "Lily Childs is a unique voice in horror fiction, both terrible and unsettling in its power, as darkly poetic as Poe, as gut-wrenching as Clive Barker. I'm a fan." Matt Hilton, author of the Joe Hunter thrillers. Thank you posting about Cabaret of Dread Matt, and for your kind quote. Much appreciated.